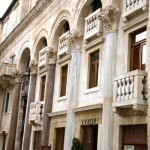 The entire town lived in the palace until people began settling on the outside in the 13th century. 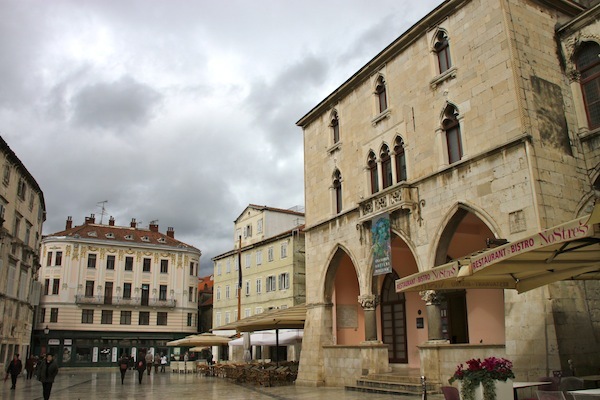 Today, 99 percent of Split’s roughly 200,000 people live outside the walls. 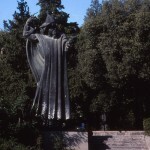 I recently revisited this UNESCO World Heritage Site with a group of travel agents on an educational tour in Croatia. 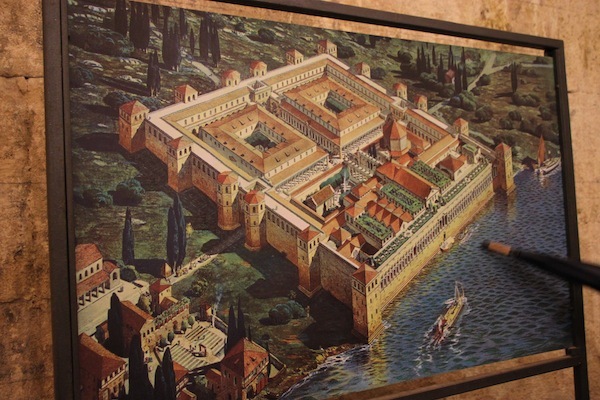 Half the palace grounds provided housing for 500 security personnel, and, our guide said, Diocletian had three bedrooms so he could sleep around for security. The guide added, perhaps unnecessarily, that the retired emperor was paranoid — probably with good reason. 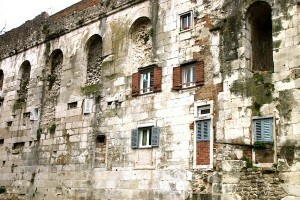 A section of wall on the north side of Diocletian’s Palace. 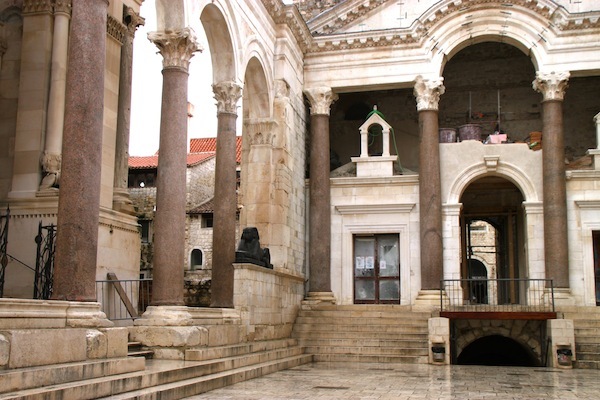 I talked about Diocletian and his palace in my book, Travia: The Ultimate Book of Travel Trivia, reporting that stone and marble for the building were taken from the Croatian island of Brac; builders of the White House in Washington drew from the same source. The emperor’s fourth century mausoleum was on the palace grounds, but ironically, this burial site for Diocletian — a persecutor of Christians — was converted into a church (St. Doimus), which our guide said is the world’s smallest cathedral. Actually, our tour began underground in a humongous basement support system that residents had filled with garbage over the centuries. Clearing the garbage, an archaeological project, began after World War II, but some of the solidified stuff has to stay because it now helps support the overhead buildings. Above ground, the palace in its current iteration is a walled village with many low-rise houses topped by red-tile roofs — and then there are the historical houses, churches, pillars and other fragments telling a 1,700-year-old story. The Peristyle, the central square in Diocletian’s Palace. This view faces the entrance to the emperor’s private quarters. The Peristyle, the central square in Diocletian’s Palace. 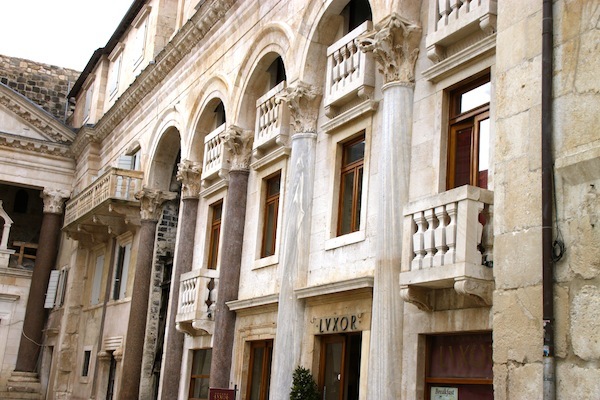 The photo reveals some of the architectural variety here, with Roman arches and Egyptian columns, original to the palace, that are now part of three medieval Venetian houses. palace’s central square, an open public space that on one end gave access to the emperor’s private quarters. His mausoleum was on one side, now the cathedral and open to visitors. Another side features a fascinating assortment of architectural styles, where our guide pointed out Roman arches and Egyptian columns, original to the palace, which are now part of three medieval Venetian houses. Split’s Piazza de Popolo, or People’s Square, with Split’s Venetian-style City Hall at right. Brothers Square, site of still more Venetian structures including a castle and tower. It’s a charming space, known locally as Vocni Square, or Fruit Square, because of a fruit market that once operated there. We viewed the exterior palace walls at two points. 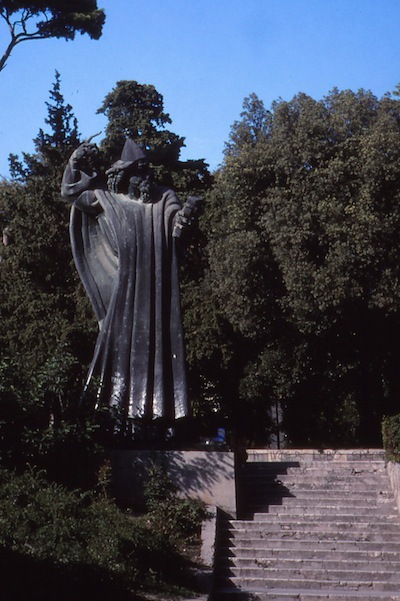 On the north side, where the stone walls were easier to see, the main attraction was a gargantuan statue of Bishop Gregory of Nin, a 10th century figure who fought to hold religious services in the Croatian language. Tourists rub the statue’s left toe for good luck. Our sightseeing ended with a little time on the broad promenade that parallels the palace’s south wall. Considering the number of outdoor cafes seen, even on the March day of our visit, this is the social side of the palace. 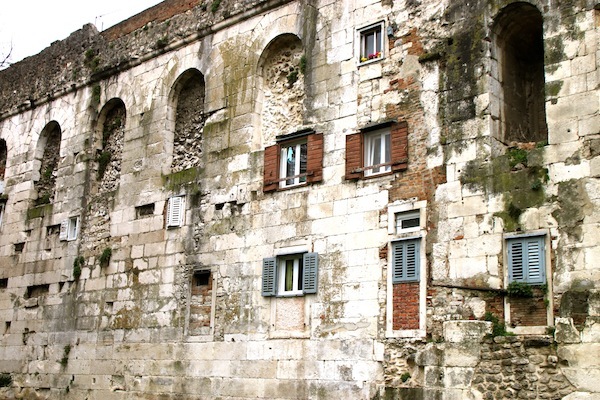 The south wall of Diocletian’s Palace. 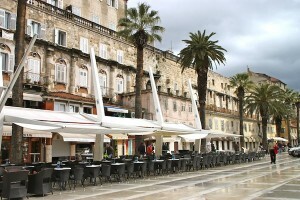 Cafes and a promenade are in front of the palace wall. The sea came right up to these walls in Diocletian’s time. Also, because of the buildings built next to the palace wall, the wall is not quite as easy to discern. The palace, when built, came right to the water on its south side. The name of the city, by the way, is a bowdlerized version of the ancient name for a local shrub. Not very exciting.